Meanwhile, cut broccoli florets from stems; separate florets into small pieces using tip of paring knife. Peel away tough outer layer of stems; finely chop stems. In large bowl, mix mayonnaise, sugar, onion, vinegar and salt with whisk. 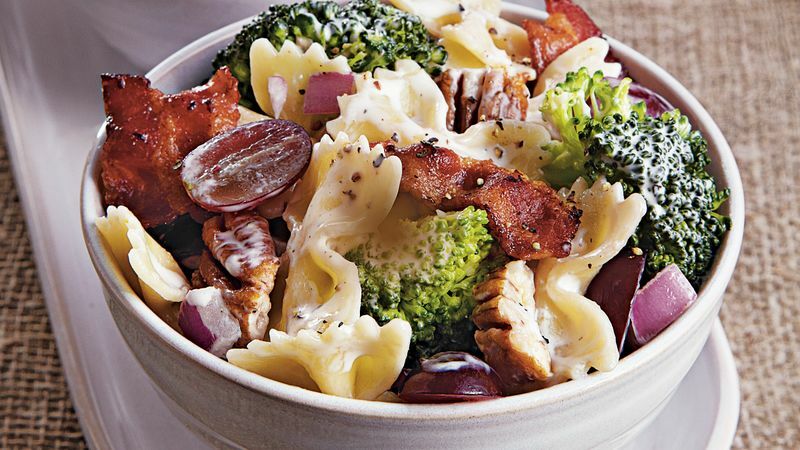 Add broccoli fl orets and stems, grapes and hot cooked pasta; stir to coat. Cover; refrigerate 3 hours. Sprinkle pecans in ungreased heavy skillet. Cook over medium heat 5 to 7 minutes, stirring frequently until nuts begin to brown, then stirring constantly until golden brown. Just before serving, stir pecans and bacon into salad. Sprinkle with pepper. Cook the pasta al dente so it’s firm enough to hold its own when tossed with the tangy-sweet dressing.